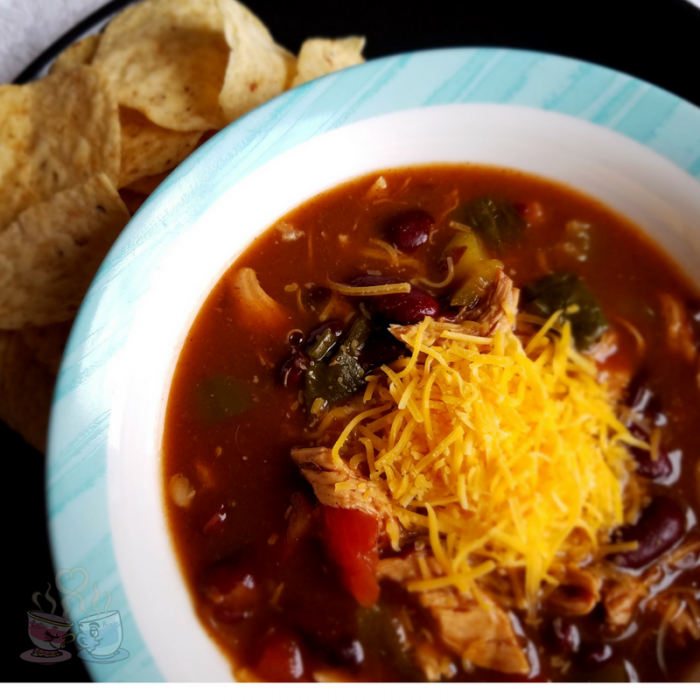 Having a good Chicken Taco Soup Recipe on hand is a must. I’ve seen tons of variations of this over the years, but frankly, this is my favorite. Why? Because it is a healthier option that doesn’t include all of the sodium from canned products. Part of my process with Weight Watchers has been to learn better healthier habits. That includes choosing real food made from scratch over processed foods. So, this recipe is a great option that comes together in under 30 minutes and still ends up being delicious! 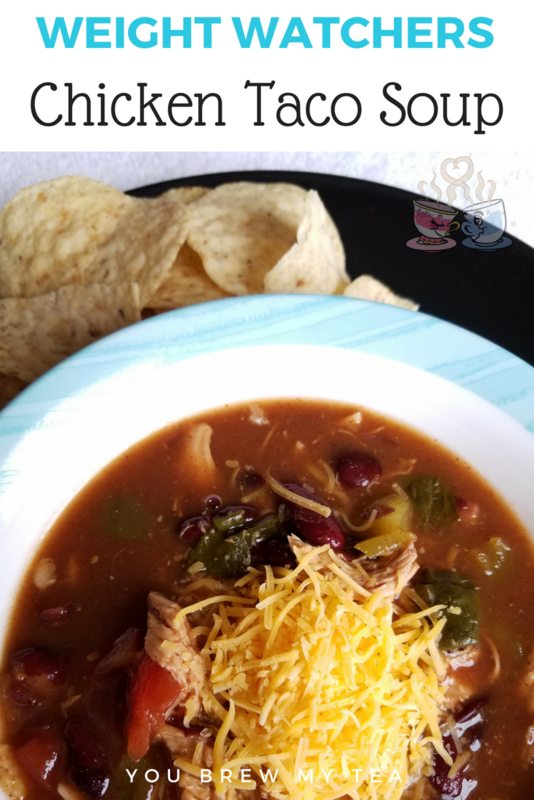 This taco soup recipe is only 3 SmartPoints per serving. That means I can have a real food meal that is satisfying and still enjoy some tortilla chips or crackers along with some cheese on top. Trust me, every point matters in this and that means you will definitely be wanting to make this recipe on a regular basis. I use prep ahead methods from my friend Alea at Premeditated Leftovers and her book Prep Ahead Meals from Scratch on a regular basis. 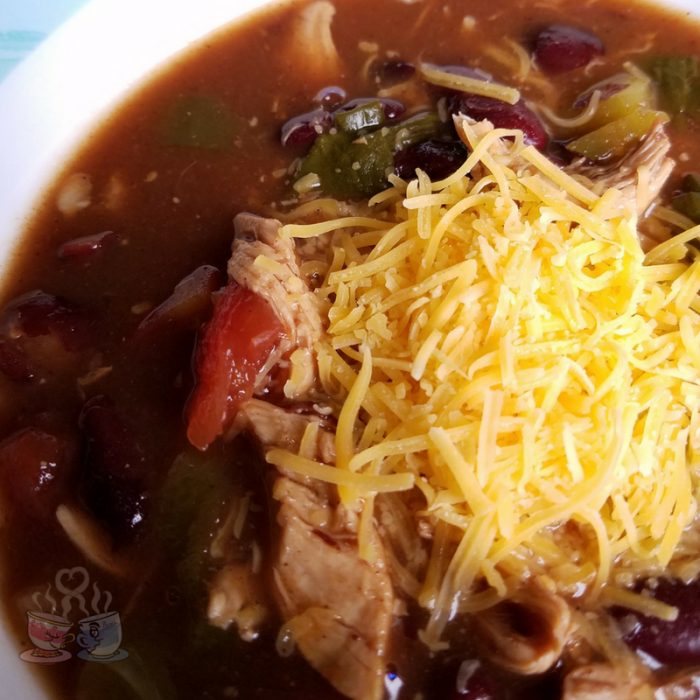 That means, I almost always have cubed or shredded cooked chicken in my freezer along with various beans and fresh homemade broths. It’s pretty easy to take time once or twice a month to batch cook foods. If you don’t have these items prepped ahead, then this will obviously take a bit more time. I do recommend grabbing a rotisserie chicken or low-sodium canned beans if needed. In a large stockpot, saute the onion, bell pepper, poblano pepper, and tomato for 5 minutes stirring regularly. You want the vegetables to be tender. Mix in chicken, broth, tomato sauce, garlic, pinto beans, and seasonings. Simmer on medium heat for 30 minutes, stirring occasionally. Serve with preferred garnishes like cheese, sour cream, or tortilla chips. I am a Weight Watchers member so I calculated this using the Recipe Builder within the program. You can also calculate using a Weight Watchers SmartPoints Calculator if you aren’t a current program member. While I am not affiliated with Weight Watchers, I am a huge fan of the program and know that it works. I am sure you’ll love this recipe as much as we do. We’ve shared tons of great soup recipes here, and admittedly, most are a Mexican themed or seasoned option, but that just seems to make them more satisfying. I love this recipe, and highly recommend adding it to your menu plan!